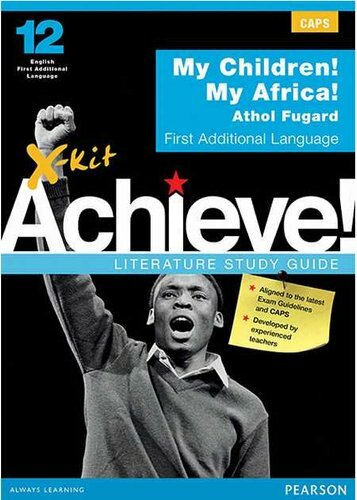 The X-Kit Achieve! Literature series offers a unique series of visually attractive, high-quality exam preparation tools. The series has been written by top South African educationalists. The books cover all the knowledge and skills tested in the final English Home Language and First Additional Language literature exams for the FET phase. Plot, theme, character, style, symbolism and imagery are all discussed in detail, and thoroughly taught and tested. Study and exam preparation techniques are covered and exam questions provided. Answers are also provided for all the questions to allow learners to monitor their own understanding. This study guide aims to provide you with sufficient support for doing really well in your Grade 12 English examination. This study guide will provide: All the background information needed for a full understanding of Cry, the Beloved Country. ; Summaries, including a precis of the whole play, plus details of acts and scenes. ; Important quotes for use in exams. ; An analysis of the play that will help you understand the plot and develop insight and appreciation. ; Pointers about the characters for quick and easy revision. ; A summary of the key themes. ; Comprehensive exam preparation assistance, including test-yourself questions, sample contextual questions and full answers; and A glossary explaining literature terminology. About the author, Alan Paton: Born in Pietermaritzburg in 1903, Alan Paton attended Pietermaritzburg College and then studied science at the University of Natal. He graduated in 1922 and obtained his teaching certificate in 1923. In 1925, he went to teach at a school in Ixopo attended by black children. In 1928, he took a post at Pietermaritzburg College, a prestigious, whites-only boys' school, where he taught for seven years. He started writing poetry and novels, but was critical of his novel-writing efforts and destroyed these early stories. In 1935, he became principal of Diepkloof Reformatory. Here, he instituted a number of reforms and the reformatory succeeded in rehabilitating juvenile criminals into society. He felt that with greater freedom in the way the reformatory was run, the boys would be better adapted to life outside the reformatory when released. At the start of the Second World War, Paton wanted to join the army, but was asked to stay on at the reformatory instead. After the war, while travelling to study prisons and reform schools elsewhere in the world, Paton had the idea for his novel Cry, the Beloved Country, which he wrote most of while travelling abroad. Paton was convinced that young urban black people drifted into crime because of a lack of opportunities to make a living and as a result of broken families and tribes around the country. This lack of stability of home and culture left the young without an anchor, and the unfair laws of the time inhibited them from finding an honest way to make a living. In creating his characters for Cry, the Beloved Country, Paton drew on three major schools of thought at that time: There was a desire by white people to keep the black people in their place. ; There was an opposite desire among black activists to demand equality more and more violently; and There was the attitude of "brotherly love" as embodied by the Christian churches predominant at that time. As a devout Christian, Paton seemed to conclude in his novel that having an attitude of brotherly love offers the only hope for the future, but this idea was fiercely opposed. Although Paton wrote this novel in 1946, the themes and issues he explores are still interesting and relevant now. This eBook is in ePDF format, which enables you to: View the entire book offline on desktop or tablet. ; Search for and highlight text; and Add and edit personal notes directly in your eBook.